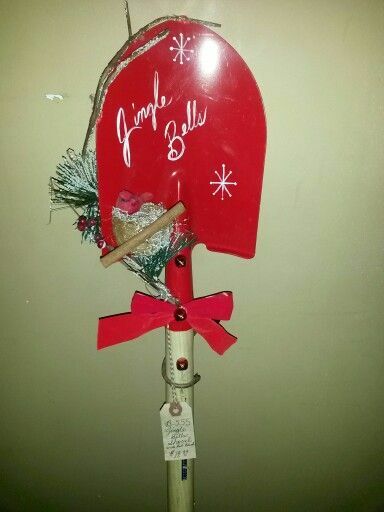 These cute, wood and metal shovels are from originally from Tractor Supply and are only $5.99 each. 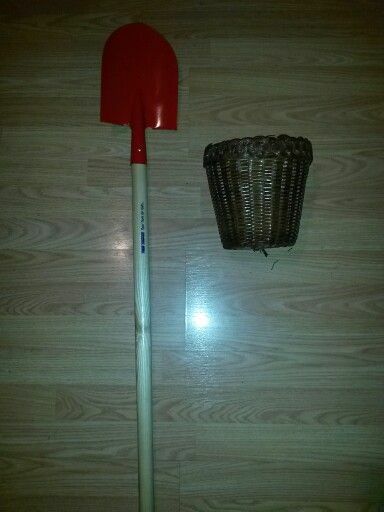 But I won them at a wholesale auction for only $2.00 each!!!! I know right!! I just had to grab a few since they are bright red and they just screamed Christmas to me. The brown basket I had on hand because I buy boxes of them at auctions for a few bucks at a time. When I got them home, here are a few ideas I tried out on them. And I am going to use one as a door greater. We call them that when we stand something up, or sit something out by the front door. Just a pretty something that greets guests. 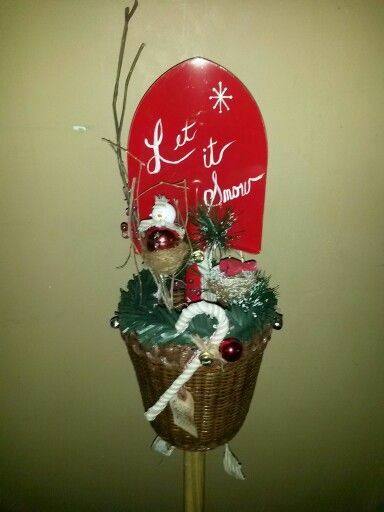 First I free handed the words "Let it snow,"
And then I thought about making the basket a holder underneath the shovel. So I too a pair of scissors and started a hole in the basket. 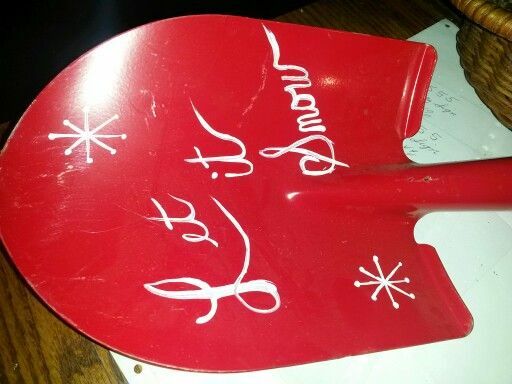 Once started, the shovel went right on through. And I secured it with hot glue at the base to keep it intact inside and out. And then I had to start thinking of some holiday things I would place in the basket as decorations. I just basically started going through my craft supplies and putting this and that in. 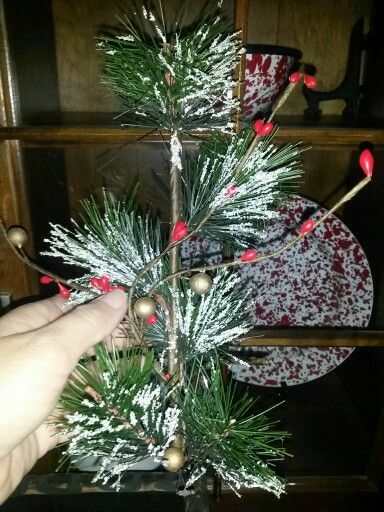 I did have about 10 of those green twigs or fillers as I call them, that look like pieces of Christmas tree limbs. They are great for things like this. 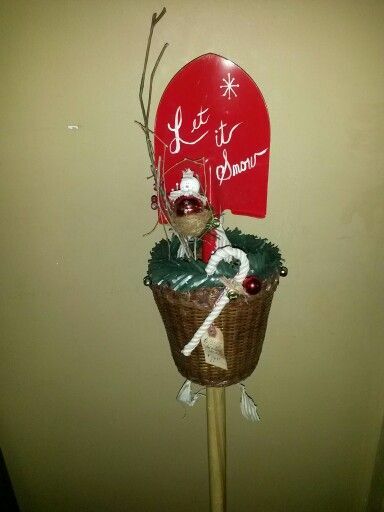 And are $1.00 at the Dollar Tree or you could easily make your own from an old tree! 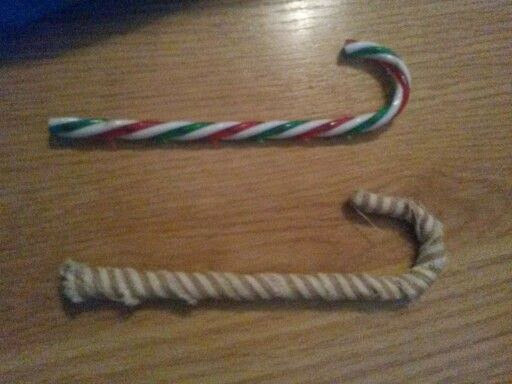 SHOVEL # 1 "LET IT SNOW"
The candy canes are easily made with homespun. I have a link here how to make them. 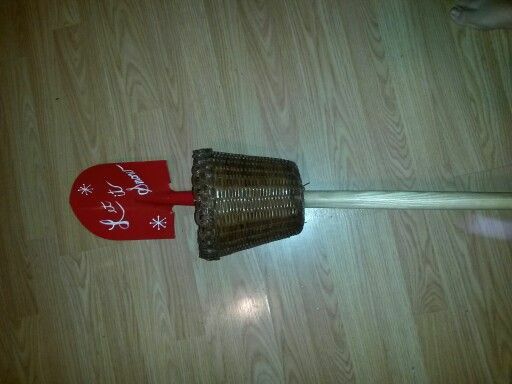 And at the bottom of the basket, I also tied a strip of homespun on to cover the hot glue strip. 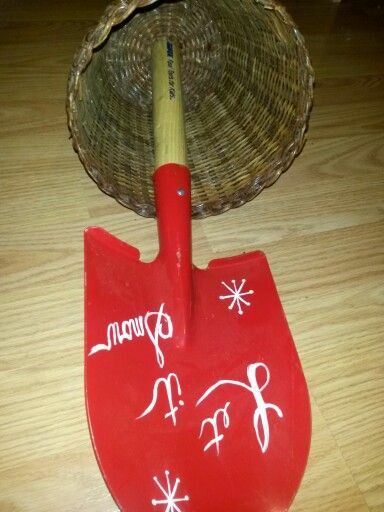 And here is a second try at another shovel. I made this one much more simpler. Just free handed on the words "Jingle Bells" and snowflakes. 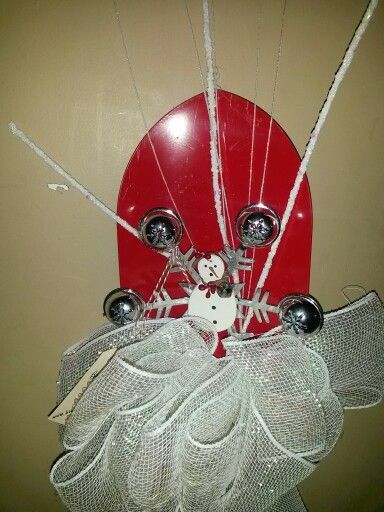 Glued on some red, metal jingle bells, a red ribbon and perched on a cute red bird in a nest. And stuck on a cinnamon stick as maybe the birdie carried it to work with, lol. I think I liked this one the most. I just love sparkly, shiny stuff at Christmas time, I guess. As you can see, I kinda used found items, like the tulle, jingle bell snowflake ornament, a wooden snowman and a frosty twig. That was about it. 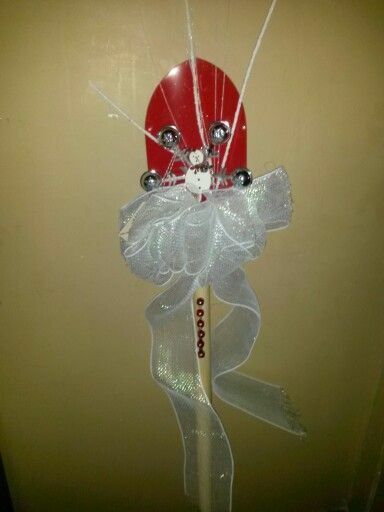 Oh yes, and the line of red, metal jingle bells down the wooden handle. I am just going to be sitting one up beside my door, without any type of stand. Because I don't think one is necessary if you find a good leaning spot. 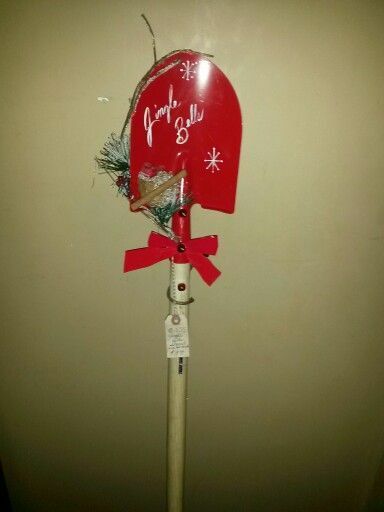 I priced these for $19.99 in my craft booth, since they are real metal and wooden shovels. If they would have been plastic, I wouldn't have priced them so high. But they are really strong feeling. I kinda felt bad, being as I only had $2.00 each in them, plus the making of them, but I do think they are worth the $19.99 this time. They were an amazing make, you are quite an inspiration with your great makes. 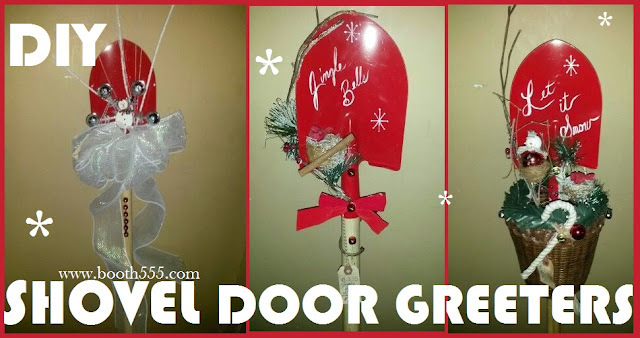 Very creative and pretty cute door greeters!